Limited Run Games isn’t the only company seeking compensation from BadLand stemming from the physical release of Axiom Verge for Wii U. Creator Thomas Happ and producer Dan Adelman have also come forward to confirm that they’re also involved in a legal battle. 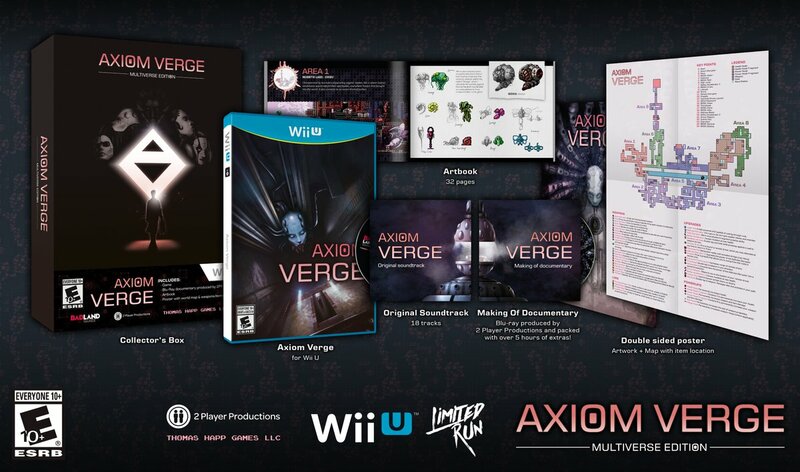 Limited Run Games just announced the long-awaited release details for Axiom Verge Wii U. We’ve been quiet about it until now, but Badland Games ripped us (me and Tom Happ) off as well. Here are some of the details. We had been approached by multiple publishers to do a physical release. The reason we went with Badland is that the CEO said he was very sympathetic to Tom’s son’s health condition. Badland made us an offer we couldn’t refuse. In addition to matching what other publishers were offering in terms of rev share, they said they’d contribute 75% of their cut to a trust fund set up for Alastair Happ’s ongoing medical expenses. Everything seemed to be going well until it came time to spend the $ to manufacture the discs and cartridges. They kept stalling, and it didn’t take long for us to figure out they were running low on funds. Badland proposed that we finance the manufacture of all of the units, and they would repay us once everything was shipped to the retailers, who would pay for the inventory upon delivery. This sent my spidey-sense tingling so I insisted retailers pay Tom directly instead. At that point, we still thought Badland was operating in good faith—they were just low on cash. We were still planning on dividing up the proceeds on the original terms. So we decided not to publicize the fact that technically Badland wasn’t publishing the game in NA. Included in the NA publishing was the relationship with @LimitedRunGames. We knew LRG had paid Badland a $78k advance, and Badland was supposed to use those funds to pay to manufacture the Wii U inventory. Badland kind of glossed over that detail until I asked. Fortunately for us, LRG agreed that that $78k would stay between them and Badland. LRG would pay Tom Happ the amounts originally agreed upon. They’ve been great allies through all of this. Badland is based in Spain, and the EU order quantities were lower, so they wanted to keep the publishing rights in Europe. EU distribution is a lot more complicated, so we agreed. Badland was able to fund production for the EU market and finally launched there. When it came time to pay Tom Happ his share for EU sales & contribute to Alastair’s health care fund (which Tom had to pay a lawyer to establish), Badland went dark on us. We didn’t even really know how much they owed us, though we have reason to believe it’s about $200k. We’ve filed a lawsuit against them, but because of the international nature of the suit, it’s proving hard to make headway. The only silver lining from any of this is that by taking over the NA retail publishing responsibilities from Badland, I got to learn that side of the business. That’s how @LeadmanGames came to exist. It’s frustrating to see @BadLand_Publish tweet about new games they’re releasing, no doubt funded with the money they owe LRG and Tom Happ. Badland has literally stolen money from a disabled toddler. BadLand Publishing CEO Luis Quintans confirmed Adelman’s comments and is aware of the lawsuit. Quintans added that BadLand had offered a soft repayment plan similar to what it had offered Limited Run, but his proposal had not been accepted. Though everyone wanted to recover their money simultaneously, he said that “it was impossible for us in that moment.” BadLand has apparently paid off 90% of what was owed as BadLand Games, but the $78,000 owed to Limited Run and the money owed to Happ are included in the remaining 10%.